Do I need a magnetic system that will just treat a part of my body or should I have a magnetic system that will treat my whole body? Should I purchase a local system? Or a whole-body system? These are the two basic choices in choosing a system. If you only have a single part of the body that needs specific attention, such as a shoulder, knee, hip, heart and so on, a local applicator system would work well. Then you should just be aware that the right intensity needs to be chosen. If you have multiple areas that need treatment, a whole-body magnetic system would be the most efficient in terms of the time needed for treatment. The question of intensity also needs to be answered. 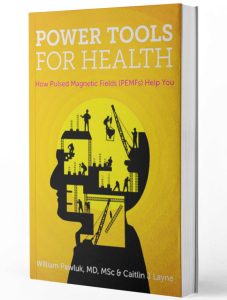 The deeper into the body the magnetic field has to penetrate and the stronger the magnetic field needs to be to treat the tissue adequately, the stronger the magnetic field of the whole-body system needs to be. Most whole-body systems have both a whole-body applicator and a smaller pad applicator. The smaller pad applicator is usually stronger than the whole-body applicator but typically significantly less strong than devices with only local applicators. Many whole-body devices are less than two G or 200 microT in maximum magnetic field intensity. These are best for health maintenance or for people with significant sensitivity. A research paper reviewing the effectiveness of these less intense PEMF systems has found that they are not as effective for specific health issues, for example arthritis, in general. Specific health conditions tend to be better managed with higher intensity whole body systems, for example over 25 gauss or 2.5 mT. Some of the best are over 150 gauss (15,000 microTesla) on the whole-body mat and 1,000 gauss (100,000 microTesla) for the small pad applicator. In another video I spoke about the importance of magnetic field intensity. Everybody needs health maintenance, if for no other reason than to slow down aging. So, even if local magnetic therapy is needed, everyone should consider whole body PEMF therapy. What some people do is to combine a lower cost lower intensity whole body PEMF system and a small portable battery-operated system for local needs, allowing freedom of movement.